Chromaffin cells, also pheochromocytes, are neuroendocrine cells found mostly in the medulla of the adrenal glands (located above the kidneys) in mammals. They are in close proximity to pre-synaptic sympathetic ganglia of the sympathetic nervous system, with which they communicate, and structurally they are similar to post-synaptic sympathetic neurons. In order to activate chromaffin cells, the splanchnic nerve of the sympathetic nervous system releases acetylcholine, which then binds to nicotinic acetylcholine receptors on the adrenal medulla. This causes release of catecholamines. The chromaffin cells release catecholamines: ~80% of Epinephrine (Adrenaline) and ~20% of Norepinephrine (Noradrenaline) into systemic circulation for systemic effects on multiple organs (similarly to secretory neurons of the hypothalamus), and can also send paracrine signals. Hence they are called neuroendocrine cells. In the mammalian fetal development (fourth to fifth week in humans), neuroblast cells migrate from the neural crest to form the sympathetic chain and preaortic ganglia. The cells migrate a second time to the adrenal medulla. Chromaffin cells also settle near the sympathetic ganglia, vagus nerve, paraganglia, and carotid arteries. The largest extra-adrenal cluster of chromaffin cells in mammals is the organ of Zuckerkandl. In lower concentrations, extra-adrenal chromaffin cells also reside in the bladder wall, prostate, and behind the liver. In non-mammals, chromaffin cells are found in a variety of places, generally not organized as an individual organ, and may be without innervation, relying only on endocrine or paracrine signals for secretion. Chromaffin cells of the adrenal medulla are innervated by the splanchnic nerve and secrete adrenaline (epinephrine), noradrenaline (norepinephrine), a little dopamine, enkephalin and enkephalin-containing peptides, and a few other hormones into the blood stream. The secreted adrenaline and noradrenaline play an important role in the fight-or-flight response. The enkephalins and enkephalin-containing peptides are related to, but distinct from endogenous peptides named endorphins (which are secreted from the pituitary); all of these peptides bind to opioid receptors and produce analgesic (and other) responses. The hormones are secreted from chromaffin granules; this is where the enzyme dopamine β-hydroxylase catalyzes the conversion of dopamine to noradrenaline. Distinct N and E cell forms exist (also Na and A cells in British nomenclature - noradrenaline and adrenaline); the former produce norepinephrine, the latter arise out of N cells through interaction with glucocorticoids, and convert norepinephrine into epinephrine. The word 'Chromaffin' comes from a portmanteau of chromium and affinity. They are named as such because they can be visualized by staining with chromium salts. Chromium salts oxidize and polymerize catecholamines to form a brown color, most strongly in the cells secreting noradrenaline. Chromaffin cells are also called pheochromocytes. 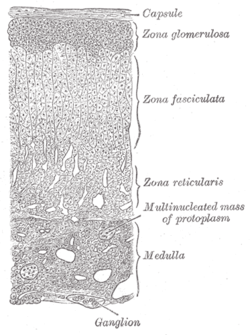 The enterochromaffin cells are so named because of their histological similarity to chromaffin cells (they also stain yellow when treated with chromium salts), but their function is quite different and they are not derivatives of the neural crest. Paraganglia are clusters of either chromaffin cells or glomus cells near sympathetic ganglia. Neoplasms arising from these cells are pheochromocytomas (also called chromaffin or sympathetic paragangliomas, in contrast to non-chromaffin or parasympathetic paragangliomas of glomus cells). Sometimes only neoplasms of adrenal origin are named pheochromocytomas, while others are named extra-adrenal paragangliomas. ↑ Ehrlich, ME; Evinger, M; Regunathan, S; Teitelman, G (Jun 1994). "Mammalian adrenal chromaffin cells coexpress the epinephrine-synthesizing enzyme and neuronal properties in vivo and in vitro.". Developmental Biology. 163 (2): 480–90. doi:10.1006/dbio.1994.1164. PMID 8200483. ↑ Schober, Andreas; Parlato, Rosanna; Huber, Katrin; Kinscherf, Ralf; Hartleben, Björn; Huber, Tobias B.; Schütz, Günther; Unsicker, Klaus (1 January 2013). "Cell Loss and Autophagy in the Extra-Adrenal Chromaffin Organ of Zuckerkandl are Regulated by Glucocorticoid Signalling". Journal of Neuroendocrinology. 25 (1): 34–47. doi:10.1111/j.1365-2826.2012.02367.x. PMC 3564403 . PMID 23078542. ↑ Perry, SF; Capaldo, A (Nov 16, 2011). "The autonomic nervous system and chromaffin tissue: neuroendocrine regulation of catecholamine secretion in non-mammalian vertebrates.". Autonomic Neuroscience: Basic and Clinical. 165 (1): 54–66. doi:10.1016/j.autneu.2010.04.006. PMID 20547474. ↑ Pohorecky, LA; Wurtman, RJ (Mar 1971). 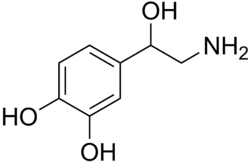 "Adrenocortical control of epinephrine synthesis." (PDF). Pharmacological reviews. 23 (1): 1–35. PMID 4941407. ↑ Szewczyk, A; Lobanov, NA; Kicińska, A; Wójcik, G; Nałecz, MJ (2001). "ATP-sensitive K+ transport in adrenal chromaffin granules." (PDF). Acta neurobiologiae experimentalis. 61 (1): 1–12. PMID 11315316. ↑ Young; Lowe; Stevens; Heath, eds. (2006). Wheater's Functional Histology (5th ed.). Edinburgh: Churchill Livingstone. ISBN 0-443-06850-X. Histology image: 14507loa – Histology Learning System at Boston University - "Endocrine System: adrenal gland, reticularis and medulla"